Arthur Weigall & the Curse of King Tut - Why were people receptive to the idea? The idea of a 'Curse of the Pharaohs' was born following the death of Lord Carnarvon after the tomb of King Tut was excavated and the ideas of people like the Egyptologist and newspaper reporter Arthur Weigall. The General Public were amazed at the unbelievable wealth, the amount of sold gold treasures, which were entombed with the minor pharaoh, Tutankhamun. 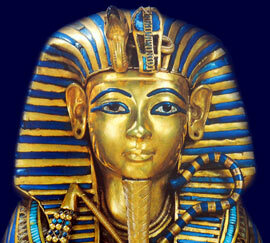 This treasure had been buried, with its owner King Tut, for over 3000 years. His resting place had lain undisturbed until the discovery of the tomb. Is it surprising that the general public perhaps felt that it was wrong to disturb King Tut? Perhaps people felt that the excavation was truly an act of violation and the idea of the Curse of King Tut was a justified form of revenge on any violators of his tomb. Arthur Weigall was also fascinated by the subject. The Curse of the Pharaohs and the Curse of King Tut ideas were fuelled by a British journalist named Arthur Weigall. In 1912 Arthur Weigall working as an Egyptologist had in fact found a tomb that people originally thought belonged to King Tut. Arthur Weigall worked for the Daily Mail and was the perfect choice to go to Egypt to report on the discovery of the real Tomb of King Tut. Arthur Weigall then came into almsot immediate opposition with Lord Carnarvon due to the exclusive rights on the story that Lord Carnarvon had granted to the rival, The Times newspaper. Lord Carnarvon had signed a £5,000 contract with the London Times, plus 75 percent of all profits from the sale of Times articles to the rest of the world. Arthur Weigall was furious about this monopoly on the news of the tomb of Tutankhamun. Arthur Weigall and other reporters were forced to find different angles to cover the story in addition to the Times stories that were fed to newspapers. Arthur Weigall said he felt "pity" for the "ordeal" the mummy faced. Arthur Weigall started to play his part in the myths and legends which surrounded the story of the Curse of King Tut. which stood for the powers of old dynasties…"
It is easy to see how Arthur Weigall, an Egyptologist, was able to fuel the myths and legends which surrounded the story of the Curse of King Tut. Each section of the King Tut website addresses all topics and provides interesting facts and information about the Golden Age of Pharaohs and of Egypt. The Sitemap provides full details of all of the information and facts provided about the fascinating subject of the Pharaoh Tutankhamun including facts and information about Arthur Weigall & the Curse of King Tut!